Seeking uncomfortable truths about atrocities perpetrated against citizens has become an integral part of rebuilding societies after the fall of authoritarian regimes or at the end of armed conflicts. In West Africa, Nigeria, Sierra Leone, Ghana,Liberia, and Cȏte d’Ivoire are among countries that have walked this path. The setting up of the Truth, Reconciliation and Reparations Commission in The Gambia is no different. It follows over twenty years of authoritarian rule under Yahya Jammeh marked by egregious violations of human rights. The alleged crimes included torture, disappearances, and extrajudicial killings of people perceived to be opponents by the dreaded National Intelligence Agency and Jammeh’s loyal death squad, the Jungulars. It took the intervention of the West African regional powers to install Adama Barrow after his surprise electoral victory over Jammeh in elections held in 2016. When Barrow took over, one of his first promises was to establish a truth commission to chronicle past atrocities. After extensive consultations with ordinary citizens, civil society organizations, and international human rights institutions, a new law was passed in 2017 to facilitate the setting up of a truth and reconciliation commission. The act required that a historical record be put down of the nature, causes, and extent of human rights abuses committed under Jammeh between July 1994 and January 2017. The commission’s mandate includes investigating violations and abuses of human rights and identifying who was involved; establishing the identity of victims, their fate, and the extent of the harm suffered; and, finally, determining what evidence has been destroyed to conceal violations and abuses. The process is to be welcomed because families will finally know how their relatives disappeared or were killed. In the course of the hearings, public apologies by perpetrators will be offered. But searching for truth is often difficult. Through testimonies and the collection of information from various places, the commission will come across many truths of what happened. The complex task will be how to establish what is actually truthful, and what is not. The Commission requires witnesses to be truthful in their evidence. For this reason, it has adopted a key International Criminal Court (ICC) procedure for getting its witnesses to testify on the truthfulness of their evidence. Article 69 (1) of this procedure states that witnesses shall “give an undertaking as to the truthfulness of the evidence to be given by that witness.” This is an affirmation to witnesses that the nation is interested in nothing but the truthfulness of the evidence. The process followed by Ghana, for example, was quite different. It offered a blanket immunity to perpetrators of past atrocities. This could allow for important disclosures and also a means to chronicle how the most serious crimes were perpetrated, which would be difficult through The Gambia’s approach. The good thing about The Gambia’s approach is that allowing criminal trials for the most serious crimes will mean greater likelihood of holding perpetrators accountable. The commission began sitting on January 7, 2019. Since then it has conducted 87 sittings at which a number of former soldiers and past and present commissioned officers of the Gambia National Army have testified. Their testimony has mainly been on the events of the July 1994 coup which ousted the country’s first president Dawda Jawara. Other officers have testified on the botched coup of November 11, 1994. So far, a number of revelations on extrajudicial killings in the November 1994 massacre have been laid bare. Some have made confessions about these killings, even within military barracks. An army colonel who was himself a victim of abuse supervised by his senior has also come forward. Another officer, a lieutenant-colonel, witnessed dead bodies of people shot in their barracks under the auspices of the military junta of Jammeh, and also the two mass graves in the Yundum barracks. Speaking at the launch of the eleven-member commission headed by a former senior official of the United Nations, Lamin Sise, President Barrow declared the “dark days” experienced under Yahya Jammeh were over. Typical of truth commissions, he rehashed the “never again” catchphrase stressing to his fellow Gambian compatriots not to revisit the country’s authoritarian past. Barrow urged the commission to put victims at the center of the process, arguing that the inclusion of reparations in the commission’s work was to ensure that the victims of the past regime received justice in all forms. The Gambian-born International Criminal Court prosecutor, Fatou Bensouda, acknowledges the complexities and uniqueness of past truth commissions in Africa and elsewhere. However, she points out that setting aside accountability of perpetrators of the most serious crimes could have a negative effect on the long term sustainable peace and social cohesion. From the sittings so far, there is no doubt the commission will unravel the circumstances of some extrajudicial killings and disappearances necessary for families to know how their relatives were killed and buried. 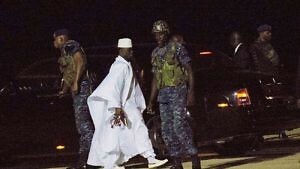 What is unclear is how Yahya Jammeh, who was the key person in the execution of these atrocity crimes, will have the opportunity to respond to allegations being made against him. Abdul-Jalilu Ateku is a Doctoral Researcher in conflict, peace and security at the University of Nottingham. This article was originally published in The Conversation.